He quotes the scholar on those mandalas, Giuseppe Tucci, a renowned Tibetologist, who sums up the Shaivite schools who divide men into three classes: the herd who need precision in what to do and not to do; the "heroes" wearied by their own laws and own contrariness against the herd; the holy souls who get beyond such struggles. 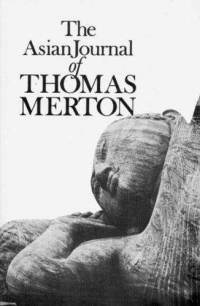 One senses Merton's own tensions with his monastic community vs. his intense desire to stay a hermit, perhaps in Alaska or Asia, far from the Kentucky abbey full of factories, tractors, and a few tourists. Can society change? His circular letter announcing his Asian visits notes his weariness with signing petitions, and he assures readers he is not going near Vietnam. He watches on the Hawaiian flight over a soldier and he prays for him from a distance. Soon, Merton's own body would come back on an Army plane for burial among his community, in the monastery he loved yet longed to get away from. This search, untimely terminated in its own mysterious way, underlies the journals he kept. On the middle way of Madhyamika in Buddhist philosophy, he notes how the teacher plays off his opponent's "principles and arguments accepted by him" to show their contradictions. "However, when his supposed values are returned to him in irony, in static, he will not accept the implications. That is his problem." I wonder if Madhyamika's own rhetorical stance could undermine the teacher himself?